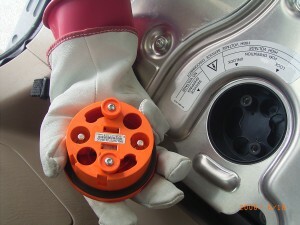 When do you need to “Safe Down” a car with a high voltage (HV) system? What order do I use? Make sure you have the correct 12 volt battery disconnected. Some HEVs have two 12 volt batteries near each other. Wear your Class 0 1000 volt currently certified HV gloves and remove the service plug, turn off the switch or pray as one European HEV does not have a service plug. Leather protectors over your HV rubber gloves is a good idea. Hide or lock up the plug or prevent the switch from accidentally turning on. On the Ford Escape and clones ACDC suggests “tape a cardboard cover over the hole and hide the plug”. This is NOT what Ford recommends. Always test as you go with a CAT III meter and wear those gloves until you know it is safe. Re-test for HV is you have left the car and it was out of your control.